The Oak Hotel - Hotel Hotel 66 Harbour Parade, Ramsgate CT11 8LN. The Oak Hotel - Hotel, 66 Harbour Parade, Ramsgate CT11 8LN. 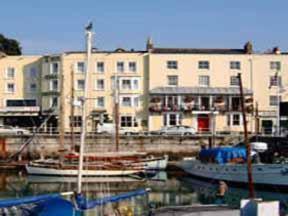 Situated in the only Royal Harbour in the country, the hotel enjoys spectacular marina and harbour views in the coastal seaside resort of Ramsgate, Kent. Only 300 metres away from Ramsgate's award winning golden, sandy beach, the hotel is also ideally set within easy reach of Ramsgate railway station, the busy town centre, Kent International Airport and Westwood Cross shopping centre. Furthermore, a short drive will bring you to other East Kent towns, such as Broadstairs, Margate, Canterbury and the Port of Dover. The Oak Hotel is also able to cater for a variety of events in the recently refurbished Tiffany Suite function room. With its own bar and facilities, the room boasts a balcony and superb views over the Royal Harbour, making it suitable for any occasion. Hotels in Ramsgate: The Oak Hotel - Hotel, 66 Harbour Parade, Ramsgate CT11 8LN.